Garlington promptly took his place among the fighting men and kneeling in plain view of Indians who, not 30 yards away, were pouring a galling fire into his little party, he continued the fight against overwhelming odds and held the ravine. Lieutenant Ernest A. Garlington, 7th U.S. Cavalry, circa 1876. Thirty-seven-year-old Ernest A. Garlington was the First Lieutenant of Captain Moylan’s A Troop and was commanding a detachment of that troop posted as sentinels just south of the dry ravine on the morning of December 29, 1890. Lieutenant Nicholson, the acting adjutant for 1st Battalion, mentioned speaking with Garlington just prior to the first shots fired that morning. Just before the firing took place, I was in rear of the center of the line of tepees on the edge of the ravine with Lieut. Garlington, who was one of the officers on guard, when he remarked to me that the squaws were saddling up and packing and that he was satisfied that they would make a break. He advised me to report the fact to Major Whitside, and I was on my way to him and had reached the opening between B and K Troops when the first shot was fired by the Indians. Garlington’s actions at the ravine that morning were highlighted in greater detail in an article in the New York Times some years later. In the battle Garlington had drawn his revolver, rallied his men and was directing a return fire, steadying his force by his example of cool commands. A rifle ball tore through his right arm, smashing forearm and elbow and the lower part of the upper arm. He fell, bleeding badly, but remained conscious. From the ground he continued to direct his men. One of the soldiers in Garlington’s troop, Private Andrew Flynn, was serving as a medic during the campaign. In later years he reminisced on treating his lieutenant’s wounds that fateful day. As I had charge of a squad of first aid men, I handled the bandages and other medical supplies and was quite busy. I may say here that the first man we picked up was our first lieutenant, Ernest A. Garlington, of Troop A. He had a compound fracture of the right elbow. I first stopped the flow of blood, although he had lost quite a lot of it. I took my lance and ripped the sleeve from his blouse. But before I had it all done, he said, “Hell! That’s my new blouse!” I cut not only the sleeve of his blouse, but his shirt sleeve, too, and stopped the flow of blood, and then took him to his tent and laid him on his bed. Then he fainted and I had quite a time with him, but had a little medicine on my hip and found a silver teaspoon and put some of the “medicine” in it and worked till I got some of it into his mouth and he opened his eyes and said, “The red devils got me!” He wanted to get his pistol, but I told him he did not need it and if he did have it he could not use it. Just four days after the battle, Colonel Forsyth recommended Garlington for a brevet promotion. He was the first soldier recommended for any form of official commendation from the campaign. I have the honor to recommend First Lieut. E. A. Garlington, Seventh Cavalry, for the brevet of captain for the admirable manner in which he managed the portion of his troop under his charge and the fighting qualities displayed by him in the performance of his duties during the battle with Big Foot’s band of hostile Indians at the crossing of Wounded Knee Creek, S. Dak., December 29, 1890. Unfortunately Lieutenant Garlington’s wounds necessitated his being evacuated to Fort Riley in early January and he was not available to testify at Major General Miles’ inquiry into the Wounded Knee affair. A little over a year after the battle Captain Ewing addressed the Association of Military Surgeons of the National Guard at St. Louis, Missouri, on April 19, 1892, wherein he provided a detailed description of wounds he treated both on the field of battle and subsequently in the field hospital at Pine Ridge. Following is his medical description of Garlington’s wounds. Lieutenant G… received a shot which entered olecranon process of right ulna, comminuting that part, passing forwards through shaft, and gained exit at the posterior surface of arm, at junction of inferior with middle third. Treatment consisted of removing portions of bone; applying antiseptic dressings, and supporting arm. This case was turned over to another surgeon the day following his arrival at the field hospital. I have since learned that this officer has rejoined his regiment. In the fall of 1891, Lieutenant Garlington was interviewed by Colonel E. M. Heyl, who at Major General N. A. Miles’s behest was investigating acts of gallantry, heroism, and fortitude on the part of the soldiers at Wounded Knee. Garlington provided the following testimony. I left camp at Wounded Knee December 27th, 1890, with a detachment of 20 men and one Indian, and made a scout down Porcupine Creek about 26 miles, to Old Batt’s Place. The Indian with me learned that two of Big Foot’s band had been there that day; that the band was to camp that night on the first creek east of Porcupine Creek on their way to the agency. I returned with my command to Major Whitside’s camp [having ridden 52 miles that day], and reported what I had learned about Big Foot’s band. The next morning Major Whitside sent Little Batt [U.S. Scout Baptiste Garnier] on the hill with a pair of field glasses to look for Big Foot. He returned shortly and reported that he saw them going (as he supposed) into camp on Porcupine Creek. Major Whitside moved out with the command, and met Big Foot with his band coming in, on their way to the agency, displaying a white flag. Major Whitside had a short talk with Big Foot, who was sick in a wagon, after which the Indians were surrounded by the troops and marched back to the 7th Cavalry camp, they had just left. I was on guard the night before the fight at Wounded Knee and that morning. I occupied the ravine when the firing began and was shortly afterwards wounded in the arm, the shot cutting off the elbow joint. I did not notice any of the officers. I left the field shortly after being wounded. Sergeant Neder, “A” Troop, 7th Cavalry, was in the ravine and exposed himself conspicuously. He has since received a medal. Private Schutt, Troop “A”, 7th Cavalry, was very conspicuous for his coolness and bravery under a very hot fire. This man has not received a medal or been mentioned. Sergeant Howard, Troop “I”, (since dead), was very gallant and conspicuous, and did most excellent work as a sharpshooter. It would probably be a source of gratification to his family to have his name mentioned honorably in orders. The War Department recognized Garlington’s gallantry with honorable mention in General Order 100, but did not act on the brevet recommendation. Two years later Forsyth wrote a letter reiterating his original recommendation and provided additional detail regarding Garlington’s actions at Wounded Knee. Four days later on March 11, 1893, Major General Nelson A. 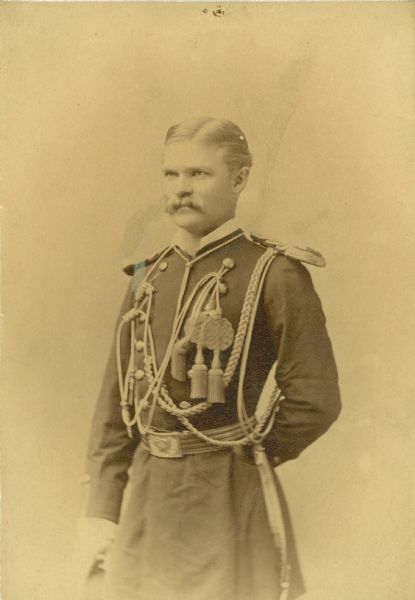 Miles, Commanding the Department of Missouri, endorsed Forsyth’s recommendation, and Lieutenant Garlington was awarded the Medal of Honor on September 26, 1893, for his actions at the dry ravine near the Wounded Knee Creek. Following is Forsyth’s second letter of recommendation. Close up of Brig. 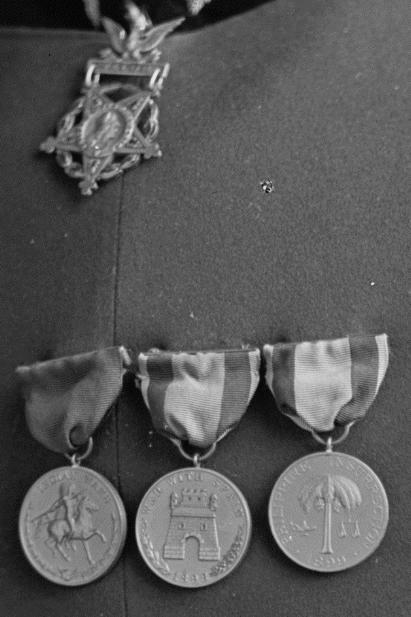 Gen. E. A. Garlinton’s Medal of Honor, and campaign medals from the Indian Wars, Spanish-American War and Philippine Insurrection. Born February 20, 1853, at Newberry, South Carolina, Ernest Albert Garlington was the second of five children of Albert Creswell and Sarah (Moon) Garlington. A. C. Garlington was a wealthy lawyer and graduate of the University of Georgia who owned over fifty slaves by 1860, twenty-two of adult age. He served as a South Carolina state senator, and during the war was a brigadier general of state troops. The Garlingtons’ five children were Mrs. Octavia Fair born 1849 and died 1928, Earnest Albert, the subject of this posting, Meredith William, born 1855 and died 1896, Harry, born 1865 and died 1936, and Albert Creswell, born 1869 and died 1882. A. C. Garlington died in 1885 and his wife, Sarah, in 1910. In 1867, the Garlington’s moved to Atlanta, Georgia, and at the age of seventeen Ernest Garlington attended the University of Georgia for three years. Garlington gained an appointment to the United States Military Academy at West Point, and matriculated in 1872. In the accompanying reports will be found the names of several officers and enlisted men whose good conduct has been deemed worthy of special mention, and I take pleasure in commending them to favorable consideration. To Lieutenants Garlington and Hare of my staff, and Mr. S. Slocum (a young gentleman who accompanied the exhibition as an amateur and who volunteered his services) I am under obligations for the gallant and indefatigable manner in which my orders were conveyed—often under a galling fire—to all parts of the field. 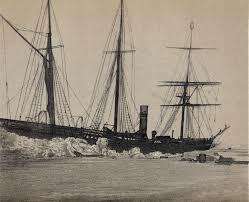 The steamship Proteus was crushed by ice in an attempt to deliver supplies to Greely’s beleaguered expedition. Photograph from the National Archives. This party was in the steamer “Proteus,” of Saint John’s, Newfoundland, chartered by the United States Government, going to the relief of Lieut. A. W. Greely, U. S. Army, at Lady Franklin bay, Grinnell Land. The steamer was crushed in the ice between Cape Sabine and Cape Albert, Bache island, on the afternoon of the 23d instant. All saved. Much provisions gotten over side of ship, but a great quantity went under before it could be removed a sufficient distance from the ship for safety. Initially Garlington was brought up on charges for the failed mission and faced a court of inquiry. The court settled with a mild chastisement of Garlington’s judgment while at the same time commending his energy, and zeal. The court placed most of the blame on Garlington’s superior, Major General William B. Hazen, but stopped short of pursing charges against either officer. Lieut. Garlington’s error in this respect is regarded as one of judgment, committed in the exercise of a difficult and unusual discretion, for which, in the opinion of the court, he should not be held to further accountability. It is also due to him to say that, in the general conduct of the expedition prior to the loss of the ship, he displayed zeal, energy, and efficiency, as well as afterward successfully conducting his command through a long, perilous, and laborious retreat in boats to a place of safety. In 1886, Garlington married Miss Anna Bowers Buford, daughter of Thomas Jefferson and Grace (Bowers) Buford. Two years earlier Miss Buford’s sister, Sarah, married another 7th Cavalry lieutenant, James Franklin Bell, West Point class of 1878 and a future Chief of Staff of the Army. The Garlington and Buford marriage produced three children: Creswell born in 1887, Buford born in 1889 and died the same year, and Mrs. Sally Chamberlin born in 1890. After more than fifteen years as a First Lieutenant, promotion to Captain came to Garlington little more than a year after Wounded Knee. In the Army’s efforts at enhancing professional development, it created the Cavalry and Light Artillery School at Fort Riley with Colonel James Forsyth, commander of the 7th Cavalry, serving as the first commandant. Naturally the other officers of the regiment served in various capacities within the new school. Captain Garlington served as an instructor of hippology from 1891 to 1895. Seeing little chance for advancement to Major under the painfully slow pace of the seniority based promotion system of the 1890s, Garlington sought a transfer to the Staff Army as an Inspector General. His request was approved, and in January 1895 he was promoted to Major, little more than three years after his promotion to Captain. Major Garlington wrote a history of the Seventh Cavalry Regiment that was published in 1896 along with historical sketches of other regiments across the Army. Following is an extract from Garlington’s regimental history describing the events surrounding the Battle of Wounded Knee. Immediately orders were issued for the concentration of a large force at Pine Ridge, under Brigadier General John R. Brooke. The headquarters and eight troops of the regiment formed a part of this force. At the same time troops were placed at strategical points north of this agency, in the Department of Dakota. One of these commands was located on the Cheyenne River in observation of Big Foot’s band, and of other Indians camped in that city. Nothing of a hostile character occurred at Pine Ridge Agency for several weeks after the arrival of the troops. 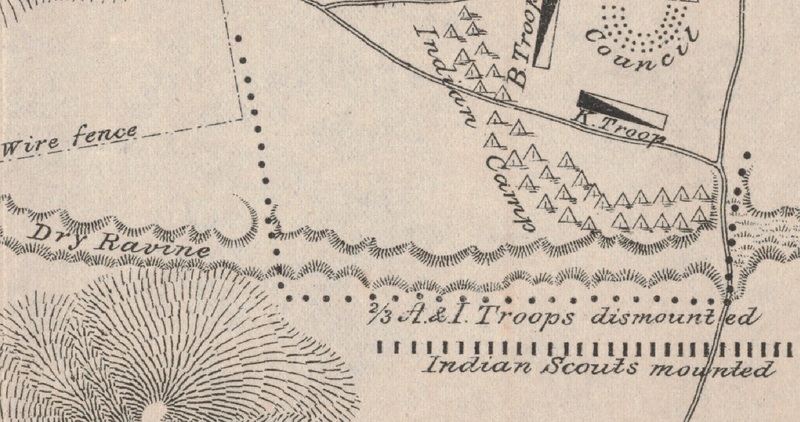 The time was spent in negotiating with a camp of Brulés and malcontents from Pine Ridge, which had been established upon the approach of troops in the Bad Lands north of White River. This was called the hostile camp. These negotiations, which looked to bringing these Indians into the agency, were progressing with a fair prospect of success until the news of the killing of Sitting Bull near Standing Rock was received, when they were to some extent interrupted. They were, however, resumed until broken off by an actual collision between the Indians and troops. Big Foot was a bad Indian, a disturbing element. In his camp the followers of Sitting Bull, who escaped when he was killed, found an asylum. There were also other renegades from the Missouri River agencies. On the night of the 22d December he escaped with his village from the troops that were supposed to hold him. The Major General commanding the Division, then at Rapid City, South Dakota, informed General Brooke of the escape, of the desperate character of the Indians, and impressed upon him the necessity of capturing, disarming and holding them under close guard. 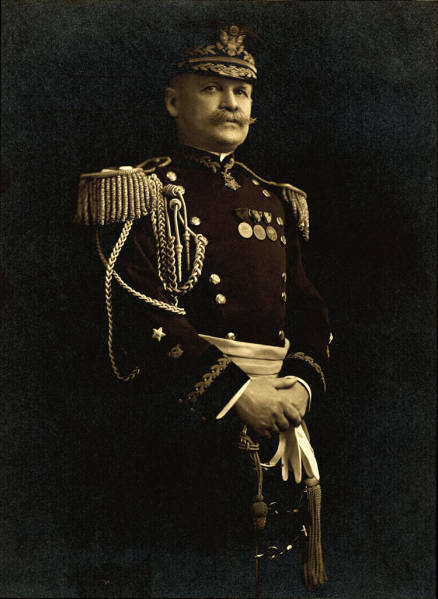 In his capacity as an Inspector General, Garlington served under General Joseph Wheeler in Cuba during the battles surrounding Santiago in the summer of 1898, and was promoted to Lieutenant Colonel that June. Two years later Garlington served as the Inspector General of the Division of the Philippines in Manila and was promoted to Colonel in March 1901. Brigadier General Ernest Albert Garlington, Inspector General of the Army. Photograph by Harris & Ewing Photography. Finally in October 1906, Garlington rose to the pinnacle of his profession when he was promoted to Brigadier General and appointed as the Inspector General of the Army. His promotion and appointment came just six months after his brother-in-law, Major General J. Franklin Bell, became the third Chief of Staff of the Army. that orders be issued as soon as practicable discharging, without honor, every man in Companies B, C and D of the Twenty-fifth Infantry, serving at Fort Brown, Tex., on the night of August 13, 1906, and forever debarring them from reenlisting in the Army or Navy of the United States, as well as from employment in any civil capacity under the Government. In making this recommendation I recognize the fact that a number of men who have no direct knowledge as to the identity of the men of the Twenty-fifth Infantry who actually fired the shots on the night of the 13th of August, 1906, will incur this extreme penalty. Being a southerner from South Carolina and the son of a former slave owner, Garlington came under scrutiny for his harsh recommendation and was widely criticized for prejudice. The Constitution League of the United States filed a motion in which Garlington was named. The investigation by Inspector-General Garlington, in which he examined only a small number of men out of the entire battalion shows that evidently he, too, had already made up his mind that the soldiers were guilty. He restricted them entirely to answering questions relative to what soldiers, if any, were engaged in shooting in the riot, and to matters bearing on the identity of those persons; and he refused to listen to any answers explaining where the soldiers were and the conditions which made it impossible for them to have knowledge of the identity of the rioters or any details or incidents of the alleged riot. Even soldiers in those three companies who were sick in the post hospital, under watch in the guard house, or in the company of some of the officers, were not immune from the blanket discharge without honor. President Theodore Roosevelt came to the backing of the newly promoted Inspector General when he wrote to the Senate. An effort has been made to discredit the fairness of the investigation into the conduct of these colored troops by pointing out that General Garlington is a Southerner. Precisely the same action would have been taken had the troops been white–indeed, the discharge would probably have been made in summary fashion…. The standard of professional honor and of loyalty to the flag and the service is the same for all officers and all enlisted men of the United States Army, and I resent with the keenest indignation any effort to draw any line among them based upon birthplace, creed, or any other consideration of the kind. President Roosevelt followed through with General Garlington’s recommendation and discharged 167 colored soldiers without honor and without a single trial. Just as with the earlier controversies of the failed relief of the Greely expedition and the battle of Wounded Knee, Garlington emerged from the Affray at Brownsville with his career and his name intact. The disgraced soldiers were not so fortunate, as their honor was not restored until 1972 when all were granted honorable discharges, all but one being posthumous. General Garlington continued to serve for another eleven years as the Inspector General of the Army retiring in February 1917 at the age of sixty-four. He died Tuesday, October 16, 1934, at San Diego, and was buried in Arlington National Cemetery one week later on the 23rd. His wife joined him in death in 1954. Brigadier General Ernest A. Garlington is buried with his wife, Anna Buford, and daughter, Sally Chamberlain, at Arlington National Cemetery. On 19 May 2004, almost seventy years after his death and one hundred and fifty after his birth, the South Carolina General Assembly adopted a concurrent resolution commending Ernest A. Garlington’s extraordinary heroism at Wounded Knee. Following is that resolution. 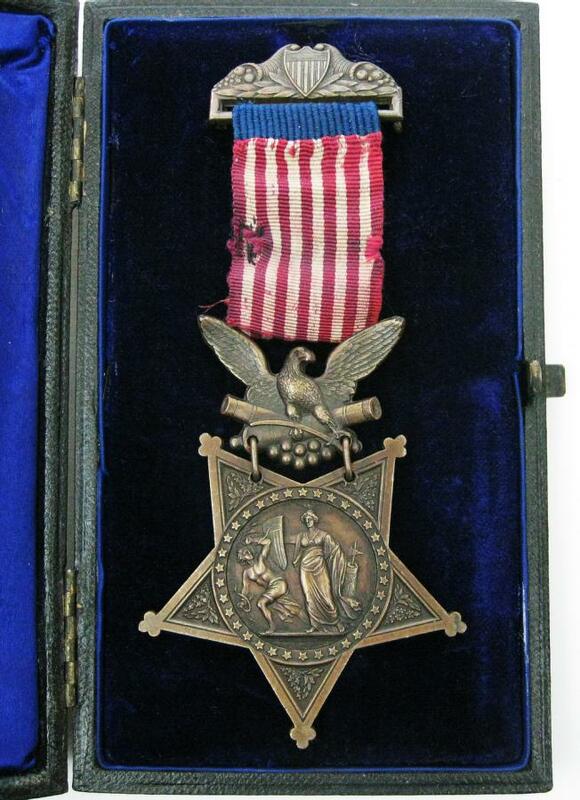 This 1862 version of the Medal of Honor is the type originally presented to Lieut. Garlington. This particular medal was presented to Private George Hobday, in Garlington’s A Troop, 7th Cavalry. TO COMMEND THE EXTRAORDINARY HEROISM OF FIRST LIEUTENANT ERNEST A. GARLINGTON WHO WAS AWARDED THE MEDAL OF HONOR FOR HIS VALOR, WHICH IS THE HIGHEST AWARD THAT CAN BE BESTOWED UPON A MEMBER OF THE ARMED FORCES OF THE UNITED STATES. That the members of the General Assembly commend the extraordinary heroism of First Lieutenant Ernest A. Garlington who was awarded the Medal of Honor for his valor, which is the highest award that can be bestowed upon a member of the armed forces of the United States. Wisconsin Historical Images, “Ernest Albert Garlington,” (http://www.wisconsinhistory.org/whi/fullRecord.asp?id=41231&qstring=http%3A%2F%2Fwww.wisconsinhistory.org%2Fwhi%2Fresults.asp%3Fpageno%3D14%26keyword1%3DDie%26search_type%3Dbasic%26sort_by%3D), accessed 15 Oct 2013. National Archives, “Sioux Campaign, 1890-91,” 669 – 671 (Nicholson’s testimony dated 7 Jan 1891). Associated Press, “Gen. Garlington, 81, Dies,” The New York Times, 18 Oct 1934. Andrew M. Flynn, “An Army Medic at Wounded Knee,” in Indian War Veterans: Memories of Army Life and Campaigns in the West, 1864-1898, comp. Jerome A. Greene (New York: Savas Beatie, 2007), 186-192. United States Congress, 66th Congress, 1st Session, May 19 – November 19, 1919, Senate Documents, Volume 14, (Washington: Government Printing Office, 1919), 455. George B. Shattuck, ed., “The Wounded of The Wounded Knee Battlefield, with Remarks on Wounds Produced by Large and Small Calibre Bullets by Charles B. Ewing,” The Boston Medical and Surgical Journal, Volume CXXVI, January – June 1892, (Boston: Damrell and Upham, 1892), 466. Adjutant General’s Office, Medal of Honor, Principal Record Division, file 3466, Record Group: 94, Stack area: 8W3, Row: 7, Compartment 30, Shelf: 2. I am greatly appreciative of the research conducted by Vonnie S. Zullo of The Horse Soldier Research Service. Harris & Ewing, photo., “Garlington, E. A. General,” Library of Congress Prints and Photographs Division, Washington DC, LC-DIG-hec-16305. 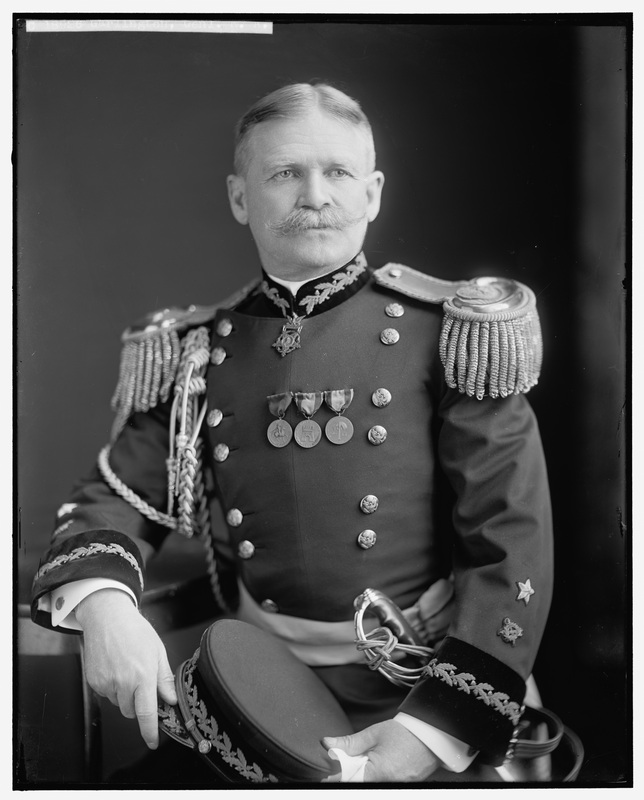 Secretary of War, “General Staff Corps and Medals of Honor,” United States Congress, 66th Congress, 1st Session, May 19 – November 19, 1919, Senate Documents, Volume 14, (Washington: Government Printing Office, 1919), 455-456. Ancestry.com, 1850 United States Federal Census [database on-line], Provo, UT, USA: Ancestry.com Operations, Inc., 2009, Year: 1850, Census Place: Newberry, Newberry, South Carolina, Roll: M432_856; Page: 187A, Image: 381; Year: 1860; Census Place: Newberry, Newberry, South Carolina; Roll: M653_1224; Page: 301; Image: 184; Family History Library Film: 805224; Ancestry.com, 1860 U.S. Federal Census – Slave Schedules [database on-line]. Provo, UT, USA: Ancestry.com Operations Inc, 2010, Original data: United States of America, Bureau of the Census. Eighth Census of the United States, 1860, Washington, D.C.: National Archives and Records Administration, 1860. M653, 1,438 rolls; Year: 1870; Census Place: Atlanta Ward 1, Fulton, Georgia, Roll: M593_151; Page: 103B, Image: 10, Family History Library Film: 545650; Year: 1880, Census Place: Greenville, Greenville, South Carolina; Roll: 1230, Family History Film: 1255230, Page: 82C, Enumeration District: 082. University of Georgia, “Garlington, Ernest Albert — Page 1,” Centennial Alumni Catalog from the Hargrett Rare Book & Manuscript Library, (http://dlg.galileo.usg.edu/centennialcatalog/html/GARLINGTON_Ernest_Albert_page1.html) accessed 24 Oct 2013; James S. Robbins, Last in Their Class: Custer, Picket and the Goats of West Point, (New York: Encounter Books, 2006), 326. Robbins, Last in Their Class, 326. United States Congress, Index to the Executive Documents of the House of Representatives for the Second Session of the Forty-fifth Congress, 1877-’78, (Washington: Government Printing Office, 1878), 512. George W. Cullum, “Ernest A. Garlington,” Biographical Register of the Officers and Graduates of the U.S. Military Academy at West Point, New York, Vols. 3 -6. Ernest A. Garlington, Report on Lady of Franklin Bay Expedition of 1883, (Washington City: Signal Office, 1883), 36. Associated Press, “Gen. Hazen’s Mistake, Findings of the Proteus Court of Inquiry,” The New York Times, 14 Feb 1884, (http://query.nytimes.com/mem/archive-free/pdf?res=F50D12FC395C15738DDDAD0994DA405B8484F0D3) accessed 24 Oct 2013. Ancestry.com. 1910 United States Federal Census [database on-line], Year: 1910, Census Place: Precinct 3, Washington, District of Columbia, Roll: T624_150, Page: 5A, Enumeration District: 0052, FHL microfilm: 1374163; National Archives and Records Administration, Burial Registers of Military Posts and National Cemeteries, compiled ca. 1862-ca. 1960, Archive Number: 44778151, Series: A1 627, Record Group Title: Records of the Office of the Quartermaster General, 1774-1985, Record Group Number: 92. Cullum, Biographical Register, Vol. IV, 269. Cullum, Biographical Register, Vol. V, 245-246. 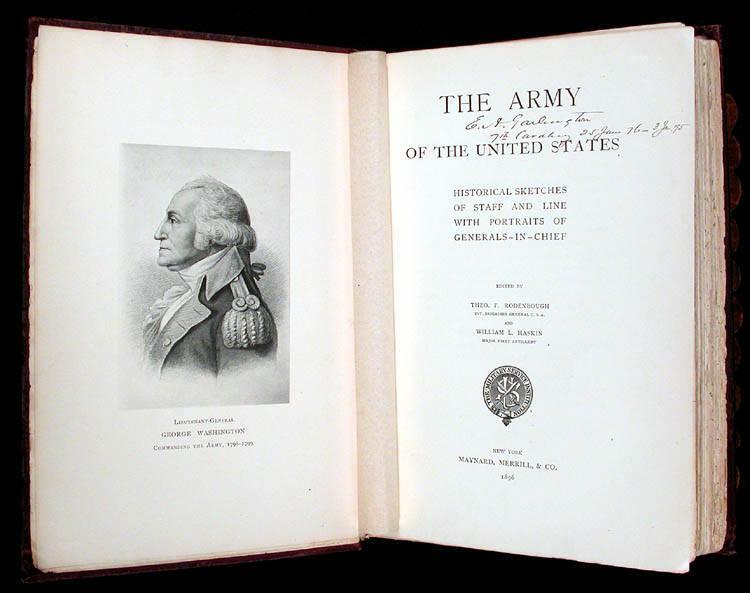 Major E. A. Garlington, “Seventh Regiment of Cavalry,” The Army of the United States: Historical Sketches of Staff and Line with Portraits of Generals-in-Chief, Theodore F. Rodenbough and William L. Haskin, eds., (New York: Maynard, Merrill & Co., 1896), 264-267. United States Congress, Affray at Brownsville, Tex., Vol. 1, (Washington: Government Printing Office, 1908), 531. John D. Weaver, The Brownsville Raid, (College Station: Texas A & M Press, 1992), 9. Cullum, Biographical Register, Vol. VI, 245; Ancestry.com, U.S. National Cemetery Interment Control Forms, 1928-1962[database on-line], Interment Control Forms, 1928–1962, Interment Control Forms, A1 2110-B, Records of the Office of the Quartermaster General, 1774–1985, Record Group 92, The National Archives at College Park, College Park, Maryland. John Evans, photo., “Gen Ernest Albert Garlington,” FindAGrave, (http://www.findagrave.com/cgi-bin/fg.cgi?page=gr&GRid=6157320) accessed 16 Oct 2013. South Carolina General Assembly, 115th Session 2003-2004, “Ernest A. Garlington,’ H. 5298, (http://www.scstatehouse.gov/sess115_2003-2004/bills/5298.htm) accessed 24 Oct 2013. Citation for this article: Samuel L. Russell, “First Lieutenant Ernest Albert Garlington, A Troop, 7th Cavalry – Distinguished Gallantry,” Army at Wounded Knee, (Sumter, SC, and Carlisle, PA: Russell Martial Research, 2013-2018, http://wp.me/p3NoJy-aY), last updated 20 Jan 2019, accessed date ____________. This entry was posted in Award Recipients, Officers and tagged 7th Cavalry, 7th Cavalry Regiment (United States), Affray at Brownsville, Big Foot, Cavalry, Charles Ewing, Ernest Garlington, Fort Riley, Greely Expedition, Inspector General, James Forsyth, Lakota, Medal of Honor, Miniconjou, Myles Moylan, Oglala Lakota, Pine Ridge, Pine Ridge Agency, Pine Ridge Indian Reservation, Sioux, Wounded Knee, Wounded Knee Creek, Wounded Knee Massacre. Bookmark the permalink. This post was updated on January 8, 2017, to include a statement by Private Andrew Flynn detailing his treatment of Lieutenant Garlington at Wounded Knee. Also, Garlington’s testimony in Heyl’s investigation of acts of gallantry, heroism, and fortitude was added. This post was updated and reposted on January 20, 2018, to correct many of the photographs that no longer displayed properly, and to incorporate Garlington’s narrative of the 7th Cavalry at Pine Ridge and Wounded Knee that was extracted from his regimental history, “The Seventh Regiment of Cavalry,” The Army of the United States: Historical Sketches of Staff and Line with Portraits of Generals-in-Chief, published in 1896.